SHYROKYNE, Ukraine -- A Russian-backed offensive would target the village of Shyrokyne in eastern Ukraine, where "there is no ceasefire" and shells explode every day. A Donbas Battalion fighter in the ruined Mayak holiday camp. If Russian-backed rebels launch a new offensive in eastern Ukraine, the shell-damaged hulk of the Mayak holiday camp will be a prized objective. Found on a hilltop beside the Sea of Azov, this sorry carcass of a building - now a frontline position for Ukrainian troops - could dictate how Europe’s war unfolds. Below lies the village of Shyrokyne, most of which is controlled by pro-Russian rebels. If they advance and capture Mayak, the Moscow-backed forces would seize a field of fire allowing them to strike towards the port city of Mariupol, 12 miles to the west. And Mariupol - an industrial centre with 500,000 people - controls the overland route to Crimea, which Russia annexed last year. As fierce exchanges of artillery and mortar fire grip Shyrokyne, there are rising fears of a new offensive towards Mariupol. The daily clashes here make a mockery of the ceasefire agreement signed in Minsk in February. “Shyrokyne is a strategic height,” said Yevgeny Adarenko, a Ukrainian military spokesman. The main building of the former holiday camp is held by fighters from the Donbas Battalion, a volunteer unit that was absorbed into Ukraine’s National Guard last year. Here, the war has settled into an artillery duel. More than 100 shells or other projectiles exploded in Shyrokyne in the space of one hour last Sunday, according to observers from the Organisation for Security and Cooperation in Europe. There are other flashpoints along the frontline between Ukrainian and pro-Russian forces, but Shyrokyne is by far the most dangerous. Since the Minsk agreement was signed, 25 Ukrainian servicemen have been killed in the village and at least 100 injured. The rebels also claim numerous casualties. All but a handful of the villagers have fled. When the separatists attack, the Donbas fighters hide in a windowless ground-floor room of the old holiday camp, whose doorway is protected by sandbags. Outside, concrete steps lead to a path where exploding shells have shredded trees and scooped waist-high craters out of the earth. On the first floor of the camp building, shells have ripped holes through the roof and walls, creating a warren of rubble. During the Telegraph’s visit, the Donbas men climbed to the roof to fire half a dozen rockets at rebel positions, using an SPG-9 anti-tank gun. Mortars were also fired from behind the Ukrainian lines. Major Sergei Filippov, deputy commander of the Donbas Battalion, admitted that his men were breaking the ceasefire. 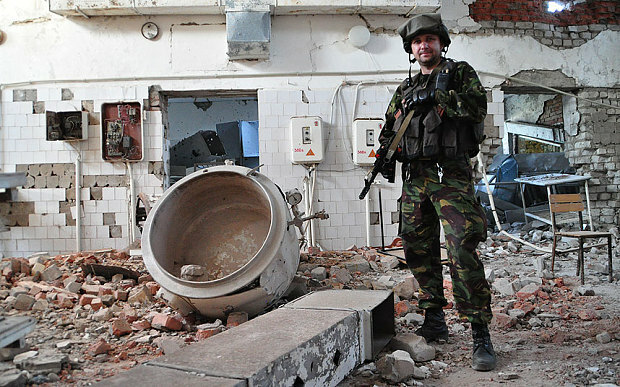 He said they were responding with small-calibre weapons after repeated separatist attacks with heavy artillery. “This is the crater of a 152mm shell, fired by a howitzer, which is forbidden under the Minsk peace agreement,” said Major Filippov, pointing towards a hole some three feet deep and five wide. In that attack, a shell fired by self-propelled artillery hit a Ukrainian trench next to Mayak, killing a 27-year-old fighter from Odessa. “My friend died, that’s why we’re firing back,” said Viktor Pylypenko, 28, who mans the anti-tank gun. It was not hard to imagine a separatist fighter on the other side of the line giving the same reason for breaking the ceasefire. International monitors have observed a partial withdrawal of forces from other stretches of the “line of control” between Ukraine’s troops and the rebels. But at Shyrokyne, the two enemies blast each-other across a 600-yard expanse of ruined village. Under the Minsk accord, heavy artillery should have been withdrawn at least 15 miles away from the frontline on both sides. Smaller arms are allowed in the area, but no weapon should be fired. Russia is massing more troops and heavy weaponry close to Ukraine - and Kiev believes its neighbour is preparing a new assault across the border. During earlier incursions, Russian soldiers helped the rebel advance. The Donbas men believe their opponents are regular Russian soldiers as well as rebels, using weapons supplied by the Kremlin. To the north-east, Ukrainian units captured two Russian special forces officers on May 16. They are now awaiting trial on terrorism charges in Kiev. In Shyrokyne, Mr Pylypenko and his comrades said they were trying to fire rockets through a window to knock out an artillery spotter. Enemy fire can come at any moment. “There is no ceasefire,” said Mr Pylypenko simply. Major Filippov, whose nom de guerre is Greyhair, is a former gas company executive and army veteran. He feels let down by Ukraine’s leadership and the governments of the West. “The Minsk accords are the same as Neville Chamberlain’s Munich Agreement – a betrayal by the leadership of Europe,” he said. In the nearby village of Berdyanskye, just behind the frontline, there is a veneer of normality. Cuckoos call in the spring sunshine and people tend their gardens. Yet the danger is ever present. Earlier in May, two shells ploughed into the garage of Petr and Anna Federchuk, killing their dog and narrowly missing their two cows. The couple were inside their house a few yards away at the time. This was not the first occasion when they had escaped death. Back in 1986, they fled their home near the Chernobyl power plant in northern Ukraine when Reactor Four exploded. “We’re too old to move and start over all again,” said Mr Federchuk, 60. Down the road in Mariupol, more than 30 civilians were killed when volleys of Grad rockets – apparently fired by the rebels – crashed into a residential neighbourhood in January. The threat of a Russian-backed offensive has caused many people to leave the city. “Business is way down,” said Olga Babina, 56, who was selling light fittings in a market.